Actually, according to this blog (which looks authoritative), posted by Richard M. Langworth in 2011, Churchill didn’t say that; there are no references available, or no attribution for that statement was found. Neither is the statement pictured authentic (according to Mr. Langworth), although it is frequently attributed to Churchill as well as Lincoln. 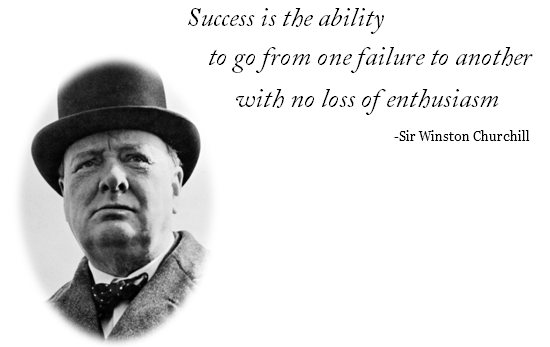 Churchill did, however, say, “…do not be carried away by success into demanding more than is right or prudent.” (He was speaking before the House of Commons in March of 1919, shortly after the Allies had won the First World War.) Which is not nearly as inspiring although it may be much more practical. This speech is re-enacted at the end of the movie; the quote attributed to him (mistakenly: “Success is not final; failure is not fatal; it is the courage to continue that counts”) appears at the very end after a few sentences describing the evacuation of Dunkirk after May 28 1940, and, five years later on May 8 1945, the victory over Germany. Then the text states, “a few months later he was defeated for re-election.” So that quote fits in that place well in the movie, although it is disappointing to find out a few minutes later through Google that the statement is apocryphal. The statement actually fits his life quite well too, since he was in the War Cabinet in the First World War and spent the entire peacetime interval between wars as a back-bencher, a lonely bellicose voice.